Among many new cool features introduced by vSphere 5 is the new VMFS file system for block storage. Although vSphere 5 can use VMFS-3, VMFS-5 is the native VMFS level of vSphere 5 and it is recommended to migrate to the new VMFS level as soon as possible. Jason Boche wrote about the difference between VMFS-3 and VMFS-5. vSphere 5 offers a pain free upgrade path from VMFS-3 to VMFS-5. The upgrade is an online and non-disruptive operation which allows the resident virtual machines to continue to run on the datastore. 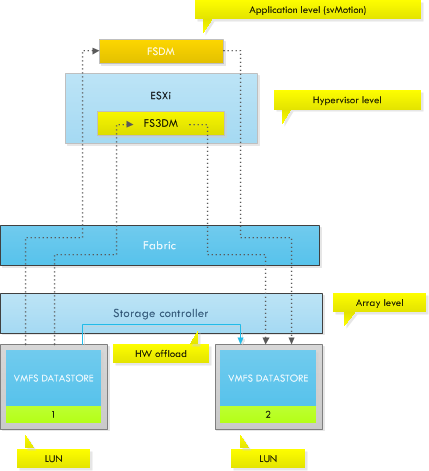 But upgraded VMFS datastores may have impact on SDRS operations, specifically virtual machine migrations. Although the upgraded VMFS file system leaves the block size unmodified, it removes the maximum file size related to a specific block size, so why exactly would you care about having a non-unified block size in your SDRS datastore cluster? In essence, mixing different block sizes in a datastore cluster may lead to a loss in efficiency and an increase in the lead time of a storage vMotion process. As you may remember, Duncan wrote an excellent post about the impact of different block sizes and the selection of datamovers. The following diagram depicts the datamover placement in the stack. Basically, the longer path the IO has to travel to be handled by a datamover, the slower the process. As the results in the table show, using a different blocksize lead to an increase in Storage vMotion lead time. Using different block sizes in your SDRS datastore cluster will decrease the efficiency of Storage DRS. Therefore it’s recommended designing for performance and efficiency when planning to migrate to a storage DRS cluster. Plan ahead and invest some time the migration path. If the VMFS-3 datastore is formatted with a larger blocksize than 1 MB, it may be better to empty the VMFS datastore and reformat the LUN with a fresh coat of VMFS-5 file system. The effort and time put into the migration will have a positive effect on the performance of the daily operations of Storage DRS. by the way are these two results using a VAAI enabled Storage? All good points about upgrading. I plan not to do it where possible. Creating new datastores and moving the VM’s into them is a much better option. Are there any implications of doing this (as it seems the fastest way to automate the migration of the VMs to empty a Datastore).